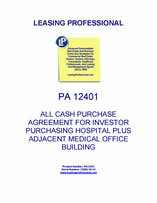 This Purchase Agreement is for a hospital and adjacent medical office building being acquired by an investor. 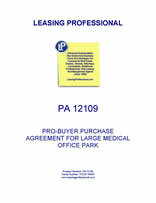 The seller is required to furnish a laundry list of due diligence materials to the buyer as itemized in the agreement. The agreement also contains a bill of sale and assignment for personal property in the facility conveyed with the real estate, a certificate of non foreign status (FIRPTA Affidavit) and a list of all service contracts for the property included as exhibits. The purchase price is to be paid in all cash at closing following the completion of due diligence by the buyer. 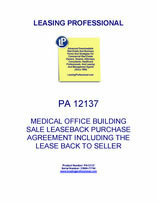 The purchaser plans to lease the hospital and medical office building back to the same tenants that now occupy those facilities, but with new leases. The property will be leased back to the seller following the closing, and this lease is included as an exhibit with this product. Also included is a form of lease guaranty for the corporate parent of the seller tenant, and the promissory note covering a portion of the purchase price.